Listening to the speeches of the Russian President, Vladimir Putin, and the President of the United States, Barack Obama, at the United Nations General Assembly in New York on Monday, one is instantly struck by the polarization of the leader’s interpretation of world events. It is obvious that one leader resides in real world, whilst the other appears to live in a deluded fantasy. You can understand why US Secretary of State, John Kerry, starts yawning 2 minutes and 47 seconds into Obama’s speech, as the US President’s delivery was completely devoid of vigour, spirit or honesty. An empty suit hypnotically going through the motions and reciting the usual propagated slogans, the US President spends as much time pausing as he does reading off his trusted teleprompter. Let’s remember how this started. Assad reacted to peaceful protests, by escalating repression and killing, and in turn created the environment for the current strife… Realism also requires a managed transition away from Assad and to a new leader. Contrary to Western media reports, Qaddafi did not initiate Libya’s violence by targeting peaceful protesters. The United Nations and Amnesty International have documented that in all four Libyan cities initially consumed by civil conflict in mid-February 2011—Benghazi, Al Bayda, Tripoli, and Misurata—violence was actually initiated by the protesters. The government responded to the rebels militarily but never intentionally targeted civilians or resorted to “indiscriminate” force, as Western media claimed. Consider Russia’s annexation of Crimea and further aggression in Eastern Ukraine. America has few economic interests in Ukraine, we recognise the deep and complex history between Russia and Ukraine, but we cannot stand by when the sovereignty and territorial integrity of a nation is flagrantly violated. If that happens without consequence in Ukraine, it could happen to any nation here today. So the US apparently “cannot stand by when the sovereignty and territorial integrity of a nation is flagrantly violated”, at the same time the US is leading a coalition in Syria which violates international law and violates Syria’s “sovereignty and territorial integrity”. Secondly, there was a referendum in Crimea and the majority voted to rejoin Russia, Moscow did not coercively and aggressively force the Crimean people into the decision. 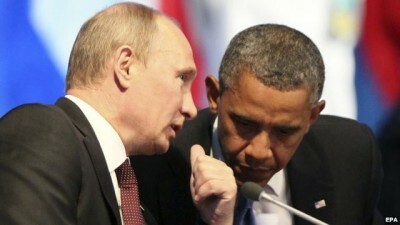 The United States and its European allies share most of the responsibility for the crisis. The taproot of the trouble is NATO enlargement, the central element of a larger strategy to move Ukraine out of Russia’s orbit and integrate it into the West. At the same time, the EU’s expansion eastward and the West’s backing of the pro-democracy movement in Ukraine — beginning with the Orange Revolution in 2004 — were critical elements, too. Although the full extent of U.S. involvement has not yet come to light, it is clear that Washington backed the coup…The United States and its allies should abandon their plan to Westernize Ukraine and instead aim to make it a neutral buffer….. It is time to put an end to Western support for another Orange Revolution…..The result is that the United States and its allies unknowingly provoked a major crisis over Ukraine. Fourthly, how can Obama say “America has few economic interests in Ukraine”, when Hunter Biden, the son of the US Vice President, Joe Biden, joined the Board of Directors of one of the largest gas company’s in Ukraine following the coup? A rare truth in Obama’s speech was when he called on Muslims to continue to reject “those who distort Islam to preach intolerance and promote violence”, adding that people that are not Muslim should reject “the ignorance that equates Islam with terror.” I completely agree with this statement. What Obama omits however, is that the majority of the radical Islamic terror groups that distort Islam are created and supported by Western intelligence agencies and regional allies in the first place. Another microcosm of truth in Obama’s speech was not anything Obama actually said, but the response by the Russian Foreign Minister, Sergey Lavrov, to the US President’s fallacious words. Even though the US has played a pivotal role in directly causing the Syrian crisis – by funding ISIS and al-Qaeda to overthrow the Syrian government – in addition to being hostile to any serious dialogue with Russia and Iran, it still didn’t stop Obama falsely claiming “the United States is prepared to work with any nation, including Russia and Iran, to resolve the [Syrian] conflict.” Lavrov’s response to the comment was a frustrated shake of the head, and a look of disbelief that someone can lie so blatantly to the world (I suggest you watch that part, it’s quite amusing – from26.15 into the speech). Hopefully however, the US will eventually come to their senses and engage seriously with key players around the world to end conflicts they played a major role in creating – I wouldn’t hold your breath though. Russia stands ready to work together with its partners on the basis of broad consensus, but we consider the attempts to undermine the legitimacy of the United Nations as extremely dangerous. They could lead to the collapse of the architecture of international relations, and then there would be no other rules left but the rule of force. We would get a world dominated by selfishness, rather than collective work. A world increasingly characterized by dictates, rather than equality. There would be less genuine democracy and freedom, and there would be a world where true independent states would be replaced by an ever growing number of de facto protectorates and externally controlled territories. But how did it actually turn out? Rather than bringing about reforms, aggressive foreign interference has resulted in the destruction of national institutions and the lifestyle itself. Instead of the triumph of democracy and progress, we got violence, poverty and social disaster, and nobody cares a bit about human rights – including, the right to life. I cannot help asking those who have caused this situation: do you realize now what you have done? But I am afraid that no one is going to answer that. Indeed, policies based on self-conceit and belief in ones exceptionality and impunity, have never been abandoned. Many recruits also come from Libya, a country whose statehood was destroyed as a result of a gross violation of the UN Security Council Resolution 1973. And now the ranks of radicals are being joined by the members of the so-called moderate Syrian opposition, [which is] supported by the Western countries. First they are armed and trained, and then they defect to the so-called Islamic State. Besides, the Islamic State itself did not just come from nowhere; it was also initially forged as a tool against undesirable secular regimes. The former head of the DIA, Michael T. Flynn, also recently admitted that the Obama administration took the “willful decision” to support the rise of ISIS. It is hypocritical and irresponsible to make loud declarations about the threat of international terrorism, while turning a blind-eye to the channels of financing… It would be equally irresponsible to try to manipulate extremist groups and place them at one’s service in order to achieve one’s own political goals, in the hope of later dealing with them. To those who do so, I would like to say: Dear sirs, no doubt you are dealing with rough and cruel people, but they are [not] primitive or silly, they are just as clever as you are, and you never know who is manipulating whom… We believe that any attempts to play games with terrorists, let alone to arm them, are not just short-sighted but fire hazardous. The Russia President stated the solution to the scourge of ISIS is to “create a genuinely broad international coalition against terrorism” in accordance with “international law”, which “similar to the anti-Hitler coalition, could unite a broad range of forces”. 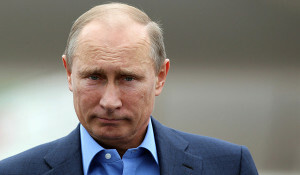 The desire to explore new geopolitical areas is still present among some of our colleagues,” Putin said. “First they continued their policy of expanding NATO,” he said, following the collapse of the Soviet Union, “they offered post-Soviet countries a false choice – either to be with the West or with the East. Sooner or later this logic of confrontation was bound to spark off a grave geopolitical crisis. This is exactly what happened in Ukraine where the discontent of the population with the current authorities was used and a military coup was orchestrated from outside that triggered civil war as a result. What is blatantly clear from listening to both leaders’ speeches is that the moral leader of the world resides in Russia.